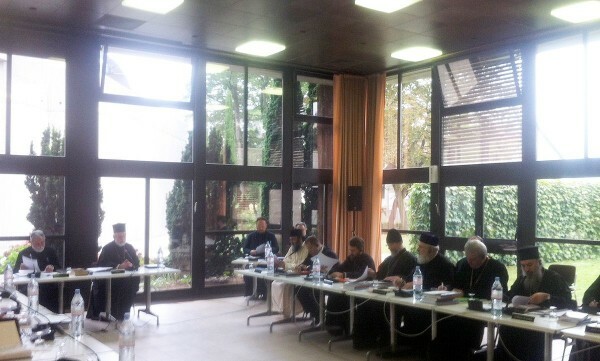 On 3 October 2014, the Special Inter-Orthodox Commission for Preparing the Pan-Orthodox Council concluded its session. The commission chaired by Metropolitan John of Pergamon (Patriarchate of Constantinople) was working in Chambesy, Switzerland, from September, 30. With the blessing of His Holiness Patriarch Kirill of Moscow and All Russia, a delegation of the Russian Orthodox Church took part in the meeting. The delegation was headed by Metropolitan Hilarion of Volokolamsk, chairman of the Moscow Patriarchate’s Department for External Church Relations, and included archpriest Nikolai Balashov, DECR vice-chairman, and deacon Anatoly Churyakov, a DECR staff member. The Commission reviewed draft documents of the Pan-Orthodox Council on inter-Christian relations, adopted at the 3rd Pan-Orthodox Preconciliar Consultation in 1986. The participants in the meeting took into account considerable changes that had taken place in a whole number of Protestant denominations in recent decades. At its subsequent meetings, the Commission will continue to edit and amend draft documents of the Holy and Great Council of the Orthodox Church. The Pan-Orthodox Preconciliar Consultation, due to be convened next year in compliance with the decision of the Meeting of Primates of the Orthodox Local Churches which was held in March 2014, will consider the results of the Commission’s work.